Shibden Hall were interested in electronically recreating parts of Anne Lister’s Diaries, allowing visitors to first view sections in their original coded format and then the same pages transcribed into English with accompanying audio. The interactive therefore provides users with a selection of Diaries designed to investigate a different aspect of Anne Lister’s life – these include Anne Lister ‘The Adventurer’, ‘The Diarist’, ‘The Entrepreneur’, ‘The Gentle Lady’ and ‘The Socialite’. Access to an introductory video is also available. 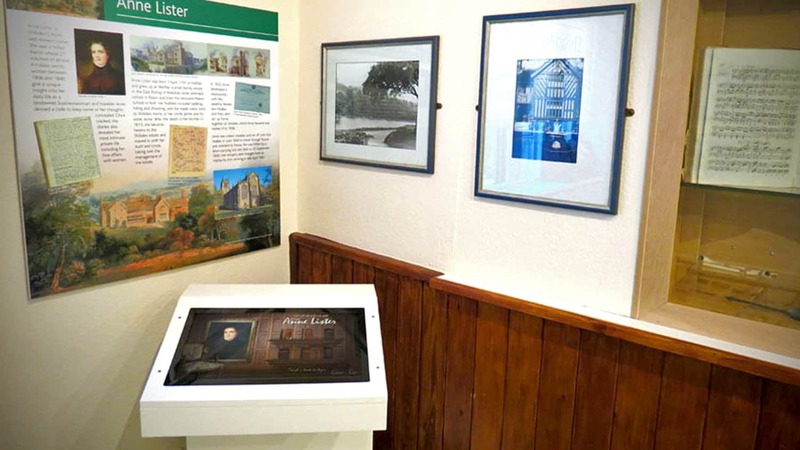 With a new interpretation space added to Shibden Hall we were commissioned to develop a bespoke museum interactive relating to the Diaries of its famous historical owner Anne Lister. Born in 1791, Anne Lister is arguably one of the most interesting women of the nineteenth century. Described as a ‘Landowner, industrialist, traveller and diarist’ Anne Lister is more famously known as Britain’s first modern lesbian. Anne Lister was a prolific diarist, writing over 4,000,000 words in her journals, much of which was in code – through the recent deciphering of this code we are given a unique insight into her life. The client team at Shibden Hall were interested in electronically recreating parts of Anne Lister’s Diaries, allowing visitors to first view sections in their original coded format and then the same pages transcribed into English with accompanying audio. The interactive therefore provides users with a selection of Diaries designed to investigate a different aspect of Anne Lister’s life – these include Anne Lister ‘The Adventurer’, ‘The Diarist’, ‘The Entrepreneur’, ‘The Gentle Lady’ and ‘The Socialite’. Access to an introductory video is also available. 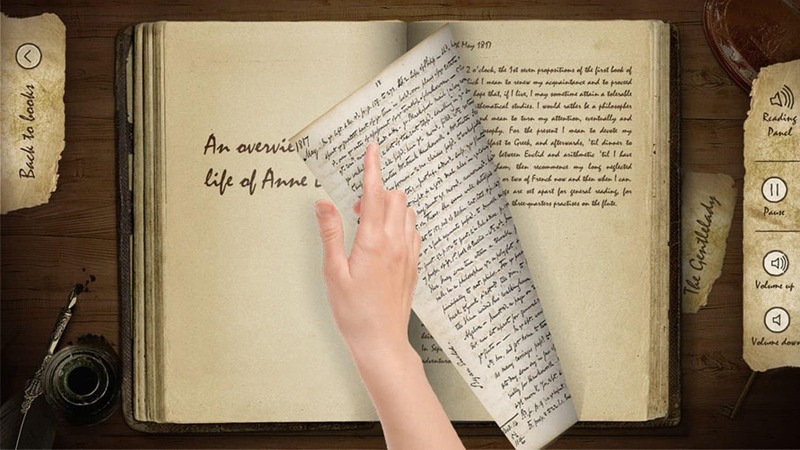 Each Diary is browsed through an intuitive ‘Page Turn’ effect, users simply turn each page as they would a real book via the touchscreen interface. Audio automatically plays where available upon each page turn with a side panel visible to allow pausing and volume control. The heritage interactive is accessible via our off-the-shelf Free Standing Kiosk.